The decision includes a quota for imported solar cells. The USTR will now engage in additional negotiations that could resolve earlier solar trade disputes. Trump's proclamation deals a blow to the U.S. solar market. The White House announced Monday that President Trump has issued a 30 percent year-one tariff on imported solar cells and modules. Tariffs will decline over a four-year period. The first 2.5 gigawatts of imported cells are excluded from the additional tariff in each of those four years, according to the U.S. Trade Representative fact sheet. The USTR noted that China’s industrial planning "has included a focus on increasing Chinese capacity and production of solar cells and modules, using state incentives, subsidies, and tariffs to dominate the global supply chain." As a result of these state-directed initiatives, China’s share of global solar cell production skyrocketed from 7 percent in 2005 to 61 percent in 2012. China currently produces 60 percent of the world’s solar cells and 71 percent of solar modules, according to the fact sheet. Over this period, the U.S. solar manufacturing industry "almost disappeared," the USTR stated, with 25 companies closing since 2012. Opponents have pointed out that only 10 percent of solar imports currently come directly from China. The majority of imports today come from factories in Korea and countries in Southeast Asia, though several are run by Chinese companies. While the administration's fact sheet centered on China, it is not the only country affected. Section 201 trade cases are intended to apply globally, and today's fact sheet makes no mention of tariff exemptions for specific countries or for any companies. However, U.S. Trade Representative Robert Lighthizer issued a statement that he will engage in additional negotiations, which could potentially lead to tariff exclusions or changes for certain parties, as GTM previously reported. "The U.S. Trade Representative will engage in discussions among interested parties that could lead to positive resolution of the separate antidumping and countervailing duty measures currently imposed on Chinese solar products and U.S. polysilicon," the statement reads. "The goal of those discussions must be fair and sustainable trade throughout the whole solar energy value chain, which would benefit U.S. producers, workers, and consumers." GTM contacted the USTR to clarify the scope of these discussions and will update the story as new information becomes available. U.S.-based crystalline-silicon solar PV (CSPV) manufacturers Suniva and SolarWorld Americas filed the petition last May under Section 201 of the Trade Act of 1974, arguing that increased imports had caused serious injury to the domestic industry. The U.S. International Trade Commission made an injury determination last year, followed by a set of recommended tariffs. Two commissioners agreed on a 30 percent ad valorem tariff on imported CSPV modules, to decline by 5 percentage points per year over four years, as well as a four-year tariff-rate quota that would allow for up to 1 gigawatt of tariff-free cell imports, increasing by 0.2 gigawatts per year. The Trump administration offered a more generous cell quota. Coupled with a relatively high module tariff, the decision could incentivize manufacturers to open domestic solar module production facilities. Reports have already been circulating that Jinko Solar may open a module factory in Jacksonville, Florida. 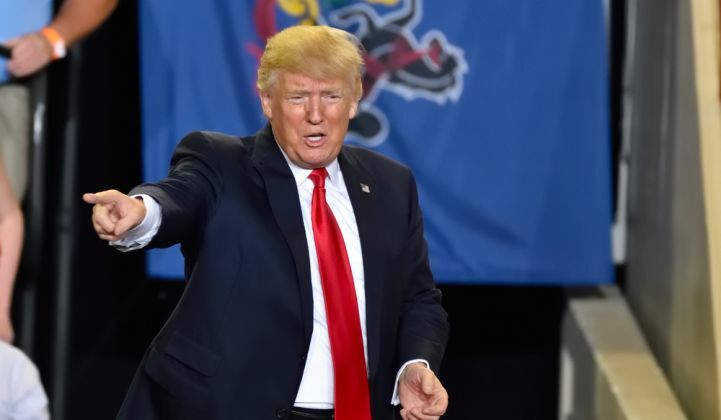 Juergen Stein, president of SolarWorld Americas, thanked Trump and the USTR for recognizing the importance of solar manufacturing to U.S. economic and national security. In the near term, President Trump's decision will deal a blow to the U.S. solar market. The Solar Energy Industries Association said today's decision will cause the loss of roughly 23,000 American jobs this year, including many in manufacturing. It's also expected to trigger the delay or cancellation of billions of dollars in solar investments. R Street Trade Policy Counsel Clark Packard said the Trump administration's decision is regrettable. “More good-paying jobs will be jeopardized by today’s decision than could possibly be saved by bailing out the bankrupt companies that petitioned for protection," Packard added. "Today's decision also will jeopardize the environment by making clean energy sources less affordable." 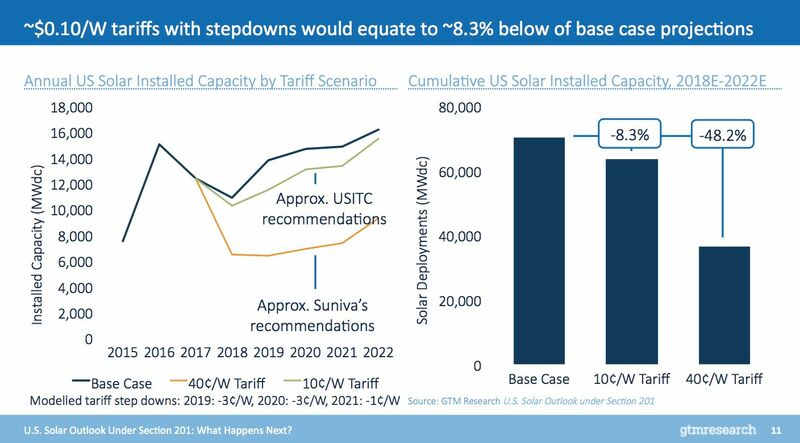 According to MJ Shiao, head of Americas research for GTM Research, today's announced tariff levels are likely to increase solar module costs by 10 to 12 cents per watt, based on current U.S. import prices of 35 to 40 cents per watt. According to a GTM Research analysis conducted last fall, a 10 cent per watt tariff is expected to slow the market by 8.3 percent. Tony Clifford, chief development officer at Standard Solar, said Trump's tariff decision may slow, but will not stop, the U.S. solar industry. Earlier this year, Tesla, in partnership with Panasonic, confirmed that solar panel and solar tile production is now underway at the company's solar manufacturing facility in Buffalo, New York. This is the most recent solar cell and module production facility to open in the U.S. Nonetheless, Tesla opposed the imposition of new tariffs on imported solar products because its domestic factory is not expected to meet all of Tesla's solar panel needs -- at least not in the short run. First Solar, which makes thin-film solar panels that are not subject to tariffs on CSPV products, came out in support of the Suniva and SolarWorld case last year. The thin-film solar manufacturer saw its stock price shoot up by nearly 6 percent in after-hours trading, at the time of publication. This story was updated to include reactions from several industry members, and to clarify that 10 percent of U.S. imports currently come from China, as well as the USTR's plans to partake in additional negotiations.